Enter our hotel and step into a visually enthralling universe made of designers' caring selections of shapes, fabrics, and materials. Enjoy floral compositions reveal the contemporary flair of the French art du bouquet. In the intimacy of your room, discover Sofitel's exclusive bedding concept, an ideal balance between softness and support. This unique sensation of comfort continues with luxurious bedding, bath towels, and bathrobes. Enjoy outstanding meals where French culinary savoir-faire is creatively applied to make the most of fresh ingredients and regional flavors. Our partners in creating fine sensorial ambiances exemplify the finest French traditions and art de recevoir. 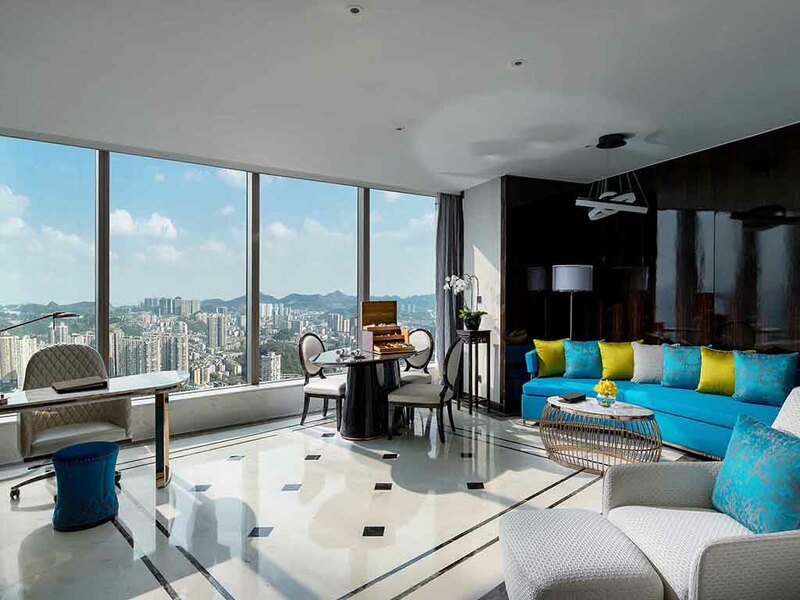 Life is Magnifique in Guiyang..
Sofitel Guiyang Hunter is located right at the fashionable Central Business District. 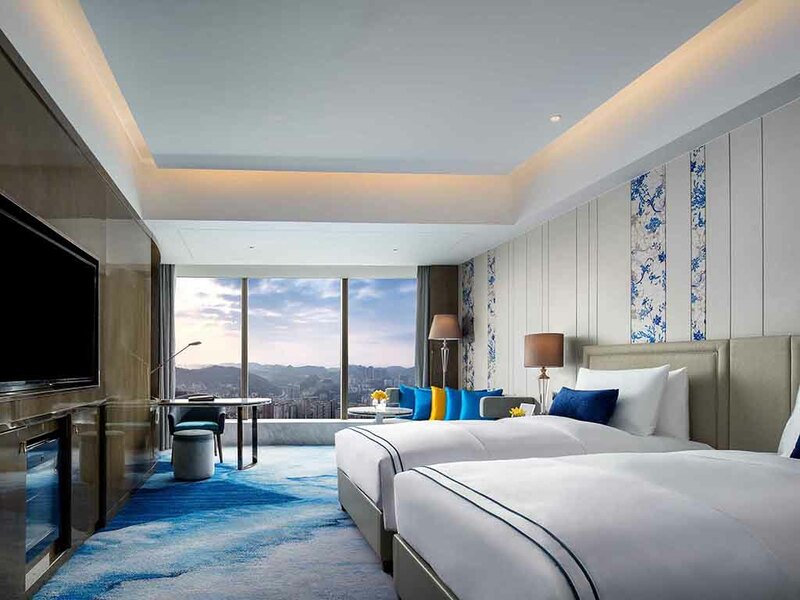 It is only 3 minutes by car from the nearby commercial offices and 20 minutes away from Guiyang Longdongbao International Airport. 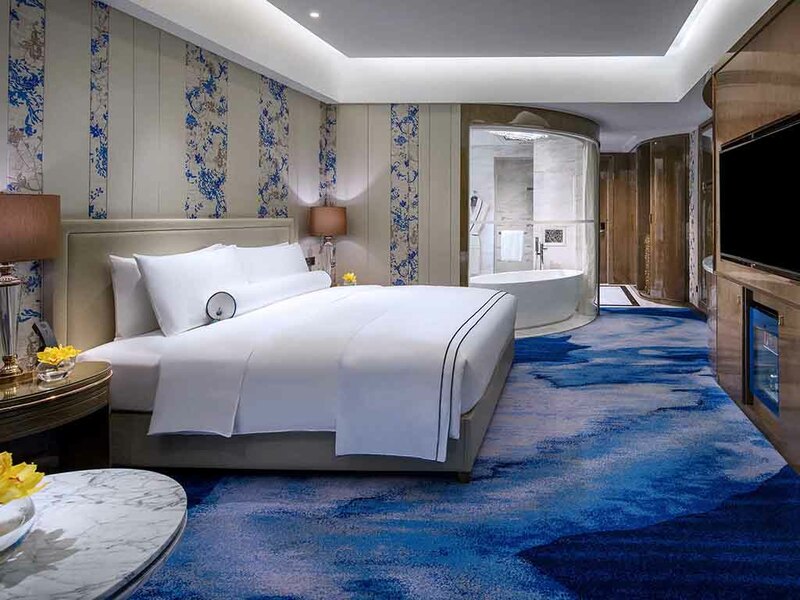 Each luxurious hotel room features French design with local accents, the signature Sofitel MyBed, separate bath and shower, LCD TV, DVD player and WiFi. 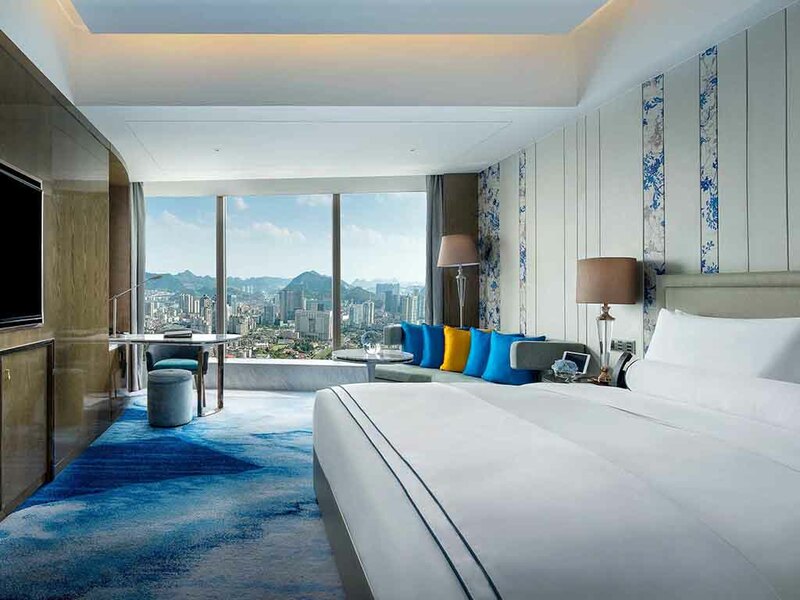 Treat yourself to a superlative hotel stay in a Sofitel suite or villa. Space, private facilities, sophisticated designs, and a fine sense of detail. Benefit from exclusive VIP services and turn your stay into a glorious experience of Magnifique luxury. 40 SQM 430 SQF Room, Infrared lighting sensors, Free WiFi, 48 inch LCD TV, Shower, Bathtub, Lanvin bathroom amenities, Mini Bar, non-smoking rooms available upon request. 40 SQM 430 SQF Room, Infrared lighting sensors, Free WiFi, 58 inch LCD TV, Shower, Bathtub, Lanvin bathroom amenities, Mini Bar, non-smoking rooms available upon request. 40 m² Room with 1 King Size Bed . Free WIFI, 58 inch LCD TV. Shower and Bathtub, Lanvin bathroom amenities, Mini Bar. Club Millésime access and benefits of daily breakfast, Apéro Chic, Le Goûter. Indulge yourself in the nice view. 40 m² Room with 2 Single Size Beds. Free WIFI, 58 inch LCD TV. Shower and Bathtub, Lanvin bathroom amenities, Mini Bar. Club Millésime access and benefits of daily breakfast, Apéro Chic, Le Goûter. Indulge yourself in the nice view. 60 m² (645 sq. ft.) Room with 1 King Bed, 65'' LCD TV, Coffee Maker, Shower and Bathtub, Lanvin bathroom amenities, Large Balcony. Free WiFi. Bath with river views. 84 m² Room with 1 King Bed, 65'' LCD TV, Coffee Maker, Shower and Bathtub, Lanvin bathroom amenities, Balcony. Free WIFI. Club Millésime access and benefits of daily breakfast, Apéro Chic, Le Goûter. Bathroom with river views. 120 m² Room with 1 King Bed, 65'' LCD TV, Coffee Maker. Shower and Bathtub, Lanvin bathroom amenities, Free WIFI. Club Millésime access and benefits of daily breakfast, Apéro Chic, Le Goûter. Bathroom with river views. 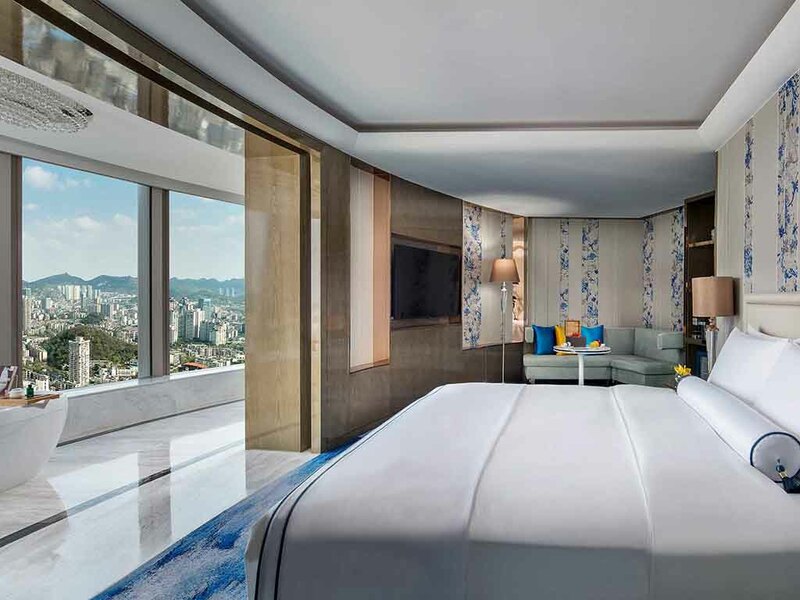 For guests desiring enhanced tranquility and services, Sofitel offers rooms on exclusive executive floors. Guest rooms and suites as well as a private dining room, lounge and fully-equipped workspace. Room Service is available 24 hours a day with a choice of local and international cuisine. Take part in a journey through French cuisine accented with local flavors and specialties. Sofitel chefs and sommeliers ensure memorable gastronomic adventures, while stunning dining rooms invite leisurely meals and offer feasts for your eyes. Appreciate the blend of French flair and native style at the Sofitel bar, where sleek décor and a lively atmosphere delight guests and locals alike. Savor a glass of fine champagne; discover the house cocktail; take part in a Wine Flight tasting session. 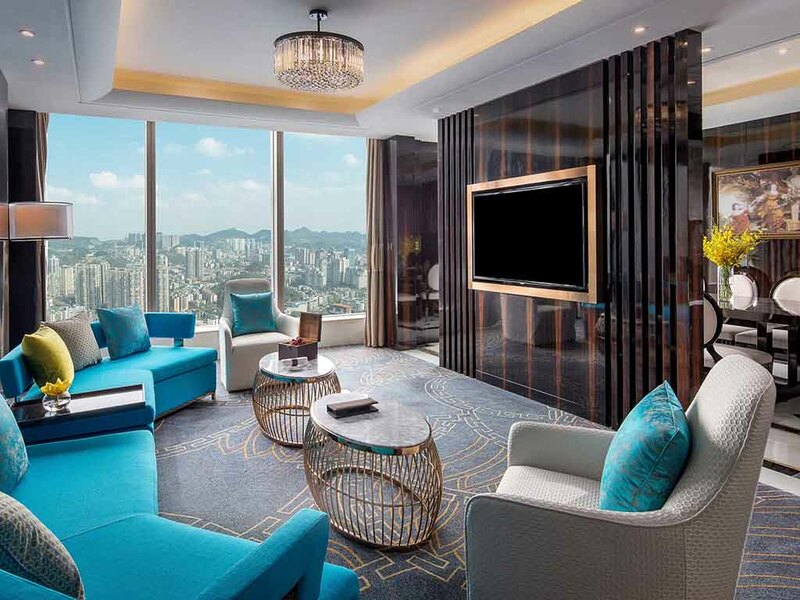 Located on the 55th floor, this lounge and intimate bar offers stunning views, and serves a wide selection of teas and coffees, an impressive collection of wines, creative cocktails and temptations fresh from our pastry kitchen throughout the day. Exceptional meetings and celebrations require more than just the right room, so allow us to infuse your gathering with French art de recevoir. Our MagnifiqueMeetings® team specializes in capturing the essence of your event. Select among imaginative, customized banqueting options, and see the ambiance you have imagined appear before you, enhanced through the Sofitel sense of detail. Benefit from high tech equipment and all the necessary business services. Have our planners recommend and organize innovative motivational activities, coffee breaks, and social mixers. At Sofitel, private celebrations and milestones become dreams come true, personalized to a T through our vast savoir faire. For your special day, Sofitel offers an ideal setting and attention to every detail. Our imaginative event team excels at translating dreams into reality. Bring us your vision and consider customized suggestions for flowers, tableware, décor, and menus. Pamper yourself at the Sofitel spa with a wide range of beauty and body treatments in partnership with the finest names in personal care. The Sofitel concierge will be delighted to provide information and aide so you can explore the area according to your criteria. Find out where to go for shopping, music, and local history and culture. Request hotel services any time, day or night. Discover the National Forest City of China with world famous Huangguoshu waterfall, Qingyan Ancient Town Scenic spots and the Jiaxiu Pavilion. We will always be on hand for any info you may need! Golfers seem to unanimously feel a connection with Sofitel's passion for precision, conviviality, and natural landscapes. Golfers of every level will appreciate our broad range of services and offers that mean enjoying your favorite sport to the fullest. Take advantage of wellness facilities as well as fitness equipment to relax and work out on your own schedule.